The tank came of age during World War II at the cutting edge of Hitler's Blitzkreig and became the most powerful machine on the twentieth-century battlefield. But what was it like to be a driver or gunner in the Battle of the Bulge, on the Eastern Front, the deserts of North Africa or the dusty plains of Iraq? From the Sherman and the Tiger to the Abrams M1, Battleground shows how tank crews dealt with the deafening noise and scorching heat of battle whilst driving and operating tons of sophisticated machinery. 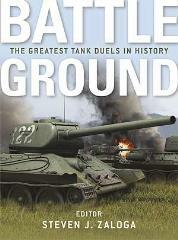 Packed with breathtaking first-hand accounts and with real-life insights and detailed drawings, this book takes readers inside the greatest tanks ever developed in the some of the most crucial duels of modern land warfare.